They Don’t Pay, We Won’t Pay – but what does it say? 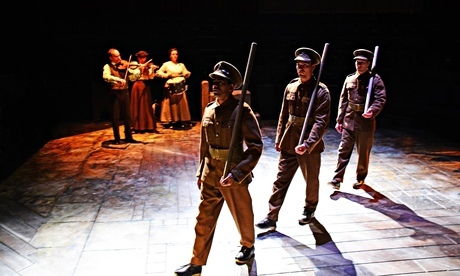 Northern Broadsides has a great track record in adapting classics for a modern-day audience. This re-telling of Dario Fo’s Can’t Pay, Won’t Pay, however, sells the story short for laughs. I may not make many friends with my current batch of reviews, but I’ve seen several plays with sell-out ticket sales, or overwhelming acclaim, or both – and I’ve not shared the enthusiasm. They Don’t Pay, We Won’t Pay, however, is going to be the toughest one to write, because I had the highest expectations for this. Deborah McAndrew and Conrad Nelson have a long track record of adapting classic plays for contemporary settings, and indeed another Dario Fo play, Accidental Death of an Anarchist, was my first experience of their collaboration, and that was excellent, with a masterful mix of comic timing and poignant messages. This time, however, one has come at the expense of the other, and the play is so hammed up for laughs it drowns out the serious meaning behind it. Hard Times is a much harder story to adapt than the other works taken on by Deborah McAndrew and Conrad Nelson, but they did the best job they could have made of it. Who called it first? Ten years ago, Accidental Death of an Anarchist was a side-show against Northern Broadsides’ main attraction of Shakespeare and other classic stories, starring or directed by Barrie Rutter, or both. And yet the husband-and-wife team of Conrad Nelson and Deborah McAndrew has grown to become an attraction in their own right, with hits from A Government Inspector and The Grand Gesture, plus a collaboration with Barrie Rutter for An August Bank Holiday Lark,with not a weak link amongst them. Now with Conrad Nelson stepping in as interim artistic director, possibly a permanent arrangement, this pair are now set to dominate the programme. So it is no surprise that after a deservedly successful run of Cyrano de Bergerac that was co-produced with the New Vic, the people of Stoke and Newcastle-under-Lyme would be queuing up for their next show.